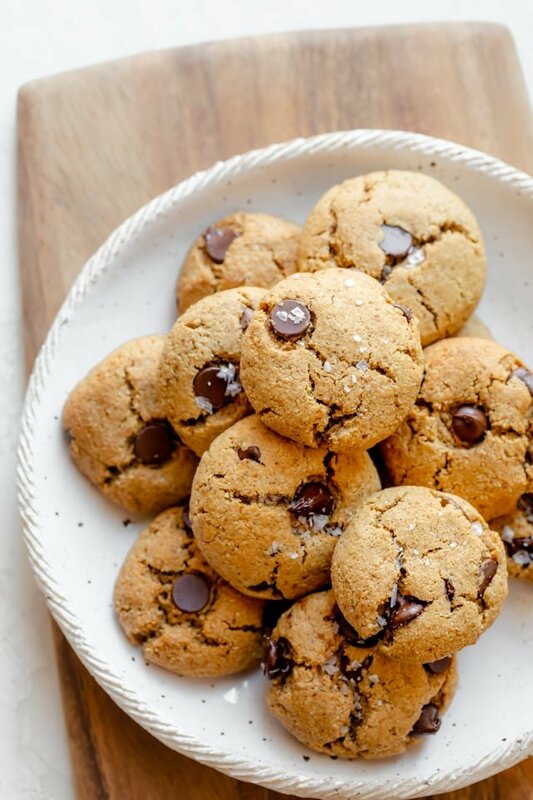 These Flourless Chocolate Chip Cookies are not only gluten-free, grain-free and dairy-free, but they are also a sweet easy healthy treat made in one bowl! If you’re trying to avoid dairy or grains for a couple days, weeks or even months, you might still have some sweet cravings, let’s be honest! And chocolate chips cookies are the ultimate sweet cravings for a lot of us. 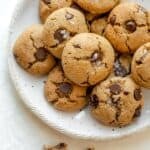 These flourless chocolate chip cookies are non only gluten-free and dairy-free but they’re also made in one bowl. And they have a delicious taste that satisfies any sweet tooth! 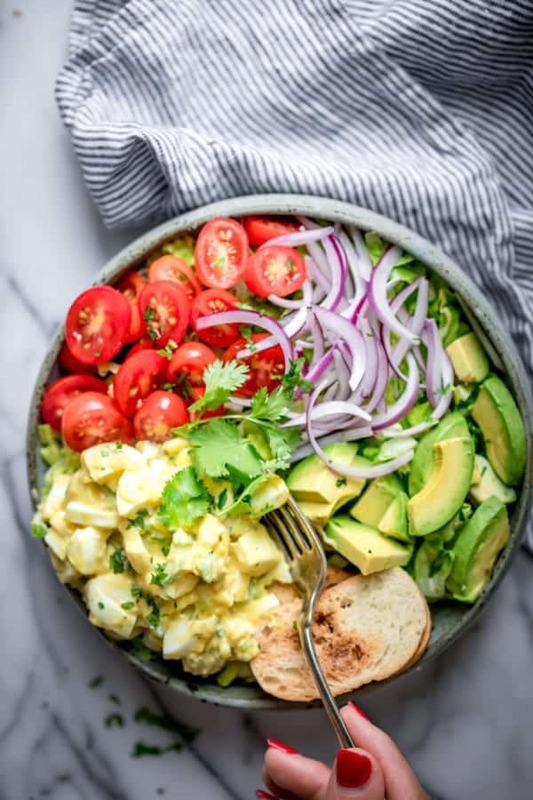 I made this recipe from the Love and Lemons Every Day cookbook Cookbook written by Jeanine and Jackie from Love and Lemons. The cookbook is full of more than 100 bright, beautiful and plant-forward recipes for every meal + desserts. These flourless chocolate chip cookies were on the first page of the Dessert section. I knew I had to make them! 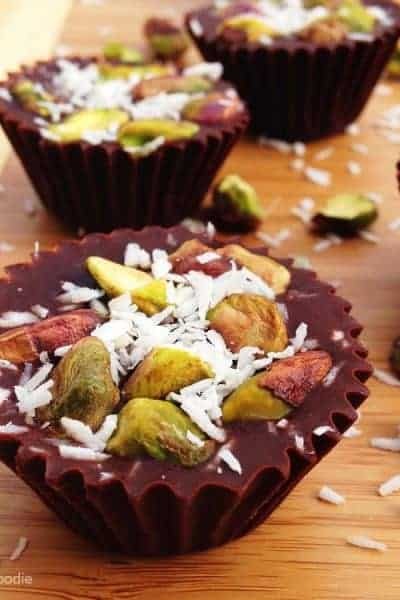 The secret is in using almond flour. This is basically just almonds that are ground in a food processor to create a fine flour-like mixture. You can create your own almond flour, or almond meal. But I find that the consistency comes out better when I buy pre-made almond flour. To start, mix the wet ingredients together. 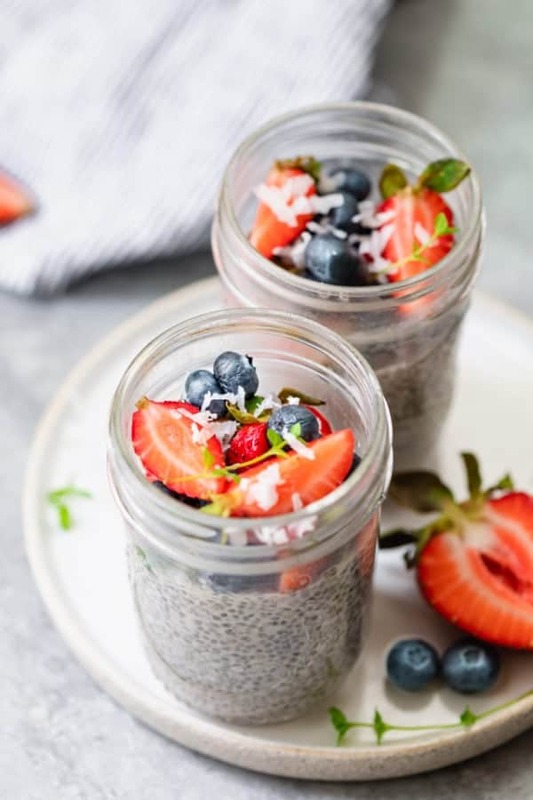 This includes the flax egg – ground flaxseed and water that is used in vegan baking to replace eggs. To that, add coconut oil, coconut sugar and almond butter. You can whisk with an electric mixer or regular whisk. Next, add the dry ingredients on top, which include the almond flour, baking soda and salt. And then fold in the chocolate chips. Finally it’s time to scoop the dough into little balls and bake them. They will spread out in the oven, So make sure you leave ample space between the raw cookie dough to allow for spreading. Cool them completely for best consistency. And they’ll pretty much stay soft and chewy for a few days! I don’t do a lot of flourless baking, but I love when it involves ingredients I’m already used to. And the few times I’ve done this, here’s what I’ve learned that might help you next time you’re baking a batch of flourless cookies. Allow the cookies time to rest in the fridge before scooping into balls. This is not necessary, but just like regular cookies, the chilling process helps them set, solidifies the butter or oil and helps them stay round in the oven. Use finely ground almond flour. As I mentioned above, you can make your own almond flour from raw almonds, but their texture may not be as fine as the store-bought professionally ground kind. This keeps the texture moist instead of gritty. Don’t overmix the batter. 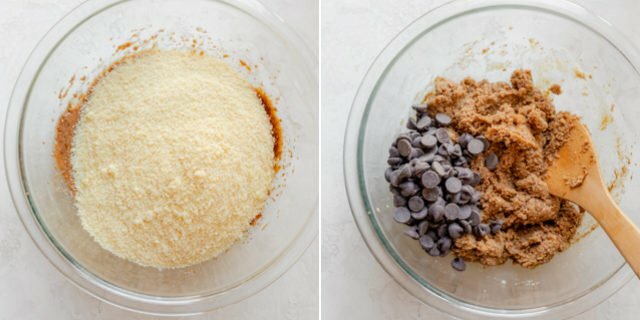 While it’s a good idea to use a whisk to mix the wet ingredients, switch to a spatula or wooden spoon when you add the almond flour and the chocolate chips. This will help you slow down the mixing process so you don’t accidentally overmix the batter and overwork the dough. 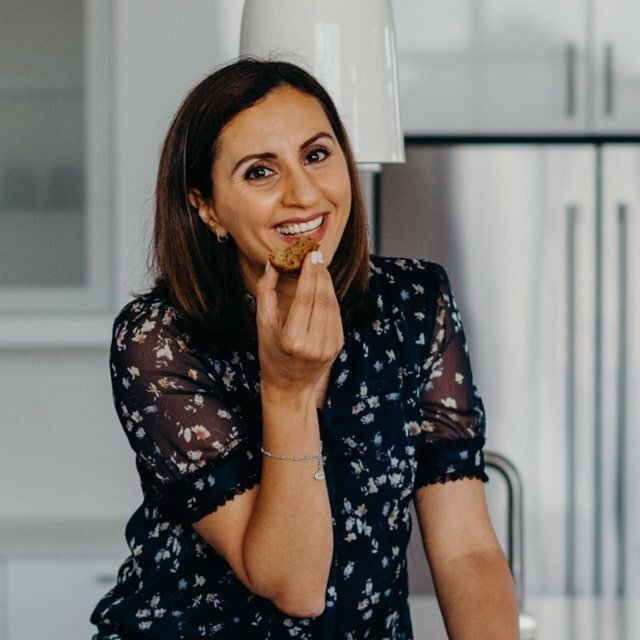 If you’ve tried this healthy-ish feel good Flourless Chocolate Chip Cookies recipe or any other recipe on FeelGoodFoodie, then don’t forget to rate the recipe and leave me a comment below! I would love to hear about your experience making it. And if you snapped some shots of it, share it with me on Instagram so I can repost on my stories! In a large bowl, whisk together the ground flaxseed and water, and let thicken for 5 minutes. To the same bowl, add the coconut oil, coconut sugar, almond butter and vanilla. Add the almond flour and sprinkle the baking soda and salt evenly over the mixture. Use a spatula or wooden spoon to stir until well combined, adding 1-2 tablespoons water if the mixture is too dry. Fold in the chocolate chips. Use a 2-tablespoon cookie scoop to scoop the dough onto the baking sheet. Press each ball down slightly and sprinkle with flaky sea salt. 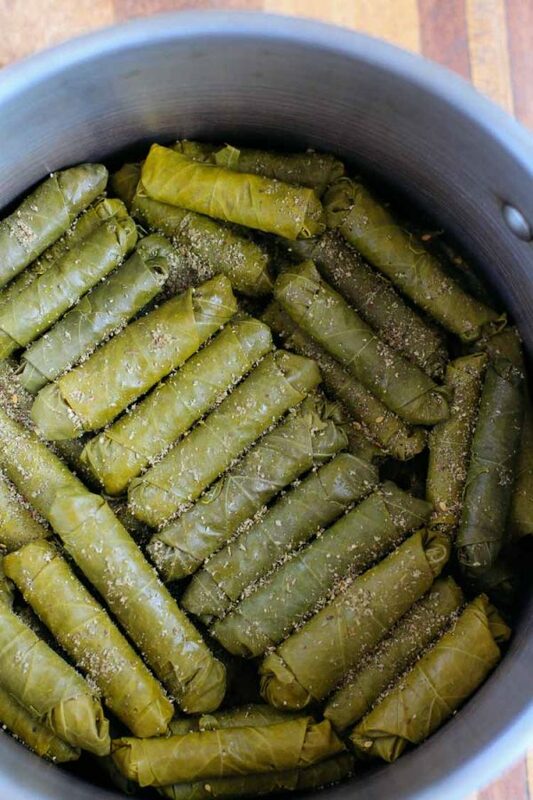 Bake for 10-13 minutes or until the edges are just starting to brown. Cool on the pan for 5 minutes and then transfer to a wire rack to finishing cooling. Makes about 16 cookies. 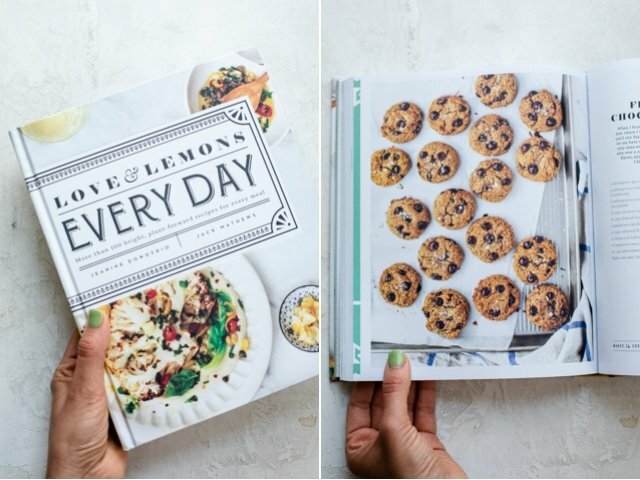 Recipe: This recipe is from the Love and Lemons Every Day cookbook. Storage: When the cookies are completely cool, they can be stored in an airtight container or frozen. Freezing Instructions: You can also freeze the baked cookies for up to 3 months. 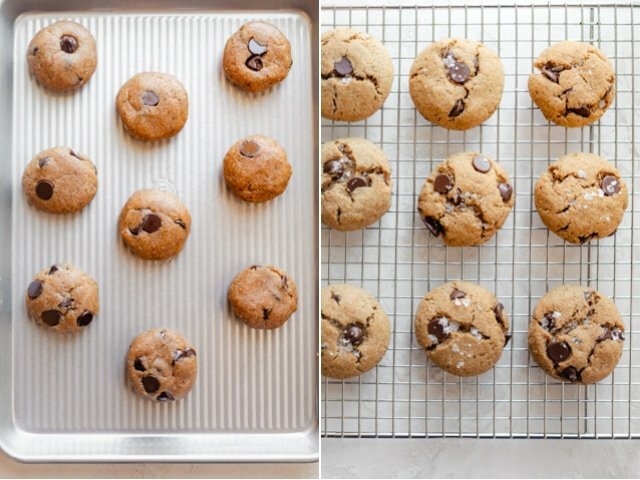 To reheat frozen cookies, bake in a 350°F oven for 5 minutes, or until until warmed through. Or, you can make the dough ahead of time, wrap tightly in plastic wrap, and freeze. When ready to bake, allow the dough to thaw in the fridge until you’re ready to form and bake the cookies. Instead of coconut oil, you can use another neutral oil like grapeseed oil or safflower oil. 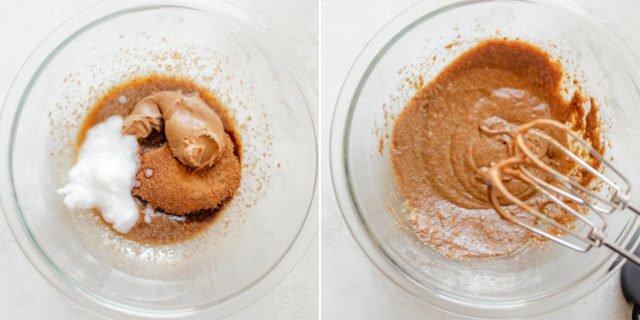 You can replace coconut sugar with brown sugar. You can substitute almond flour with other gluten-free flours, but I have only tried it with almond flour. Nutrition: Please note that the nutrition label provided is an estimate based on an online nutrition calculator. 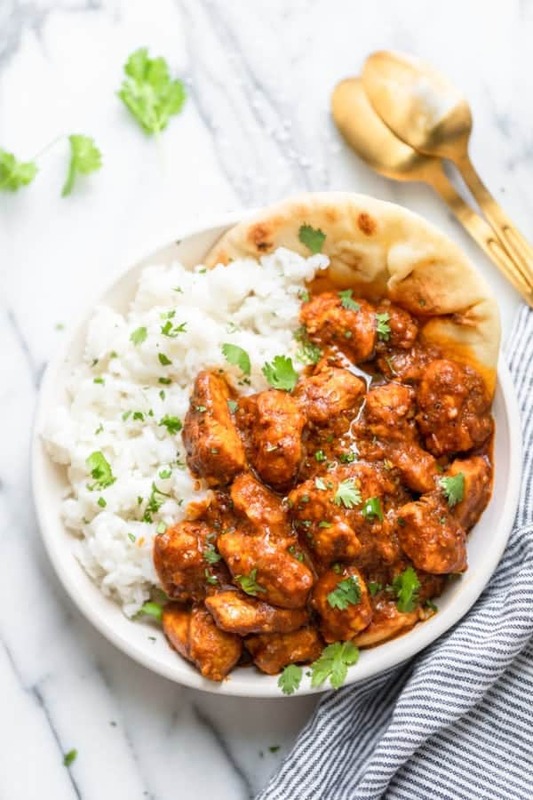 It will vary based on the specific ingredients you use. This information should not be considered a substitute for a professional nutritionist’s advice. The nutrition value is for 1 serving which is 2 cookies. 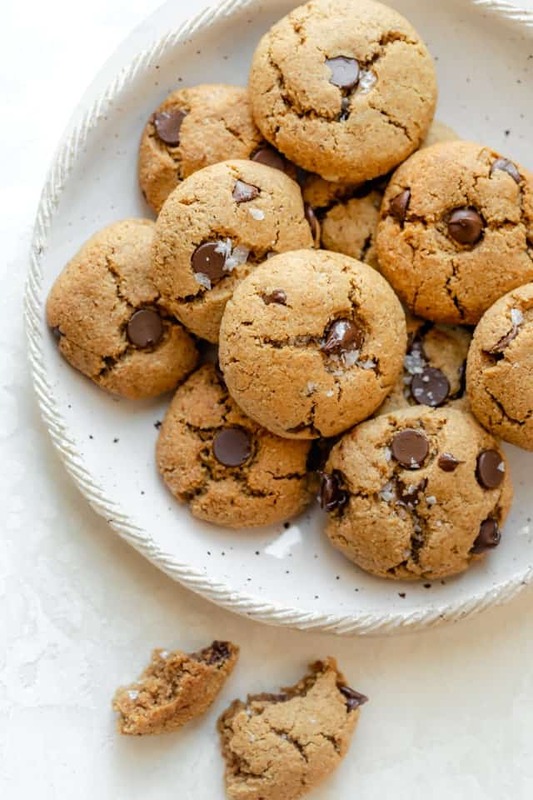 Flourless Almond Chocolate Chip Cookies Excerpted from Love and Lemons | Every Day: More than 100 bright, plant-forward recipes for every meal by Jeanine Donofrio and Jack Mathews. Copyright © 2019.